The bud from scionwood in place on rootstock using the Megachip-double-flap grafting method. This was a beginner’s graft and not perfect. 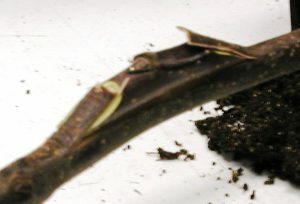 Printable information on Grafting in general and different techniques is available by clicking Practical Grafting . Tom’s favorite grafting method, Mega-Chip, is highlighted in Mega Chip Grafting . We hope to have videos of Tom grafting soon.